I turned 41 on June 22nd and I’d been feeling like I’m Not where I want to be in my Life. Feeling down and out for weeks (before 6/22nd). Smiling to keep from Crying. But those who have been through some thAngs can relate. I also realized I wasn’t doing all I needed to do in order to DO Better and BE Better. I was Blessed to be able to attend the 24th Annual ESSENCE FESTIVAL 2018 in New Orleans (July, 5th – 8th). I wanted to use this trip to GET & LIVE MY BEST LIFE as well as learn from the various seminars that would take place and I wanted to network with Beautiful Black people from all over the world. Like A New Life Chapter. 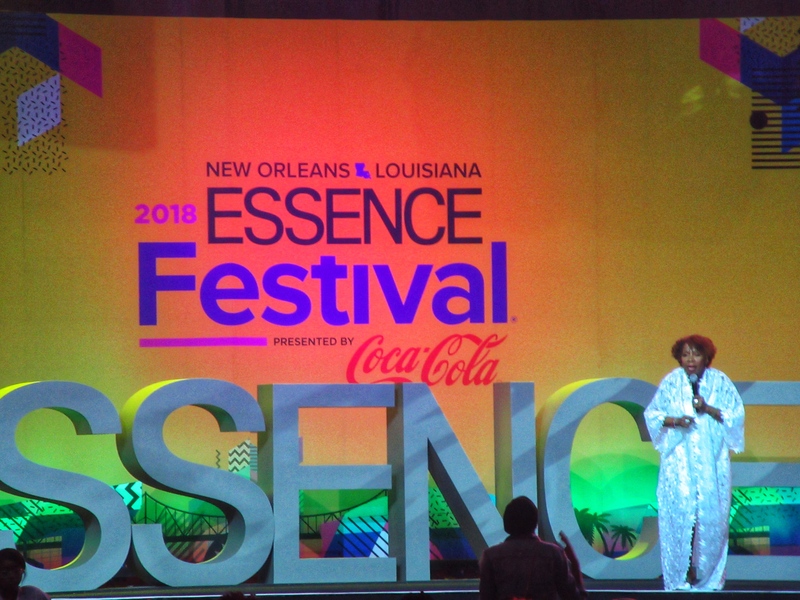 On Saturday, July, 7th 2018, I was able to go to a seminar the Amazing, Iyanla Vanzant, was doing. She has been someone who I have admired for many years. Her books have Literally changed My Life. 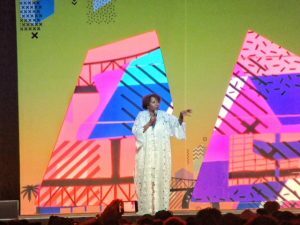 I was excited to step in the room and be Blessed by her words Live and Direct. And shes from BROOKLYN so I knew she would be Raw and Uncut with the message that was in store for us. But what she brought, I was Not prepared for. Seriously. It was like the times I have walked into church and left out feeling as if the message spoken was Directly Towards and For Me! Calvin started slinking his way towards the THE TREE OF CHANGE. When he got to the foot of it, he couldn’t figure how to lift himself up for change to begin. Mentally and Physically. He was stuck, like you get sometimes, Tyree. Like when you start thinking of a Master Plan but are not confident in yourself enough to move forward. Too scared to do something different. Make moves you’ve never made before. This is normal because we are usually accustomed to doing things one way, every time. The anxiety most times causes you to start calling and texting people. Almost as if you want them to talk you out of this ‘Change’. But Tye, you have to remember, when change comes, it will not be familiar. Growth, Healing, Change, will not show up Horizontal but instead it will be Vertical. Tyree, you have to learn from Calvin because this was one time where he didn’t call nobody. He didn’t inbox or DM no one. No text. No Facebook post. Nothing! This made it impossible for anyone to talk him out of this ‘MasterPlan’. You know how some friends and family will try and talk you out of things because they want you to stay in a rut. Not being productive. They’re attitude is, if they’re not trying to change than why should you? My Beloved, Tyree, sometimes you have to remove people in order to stay focused. Get rid of the interference of others. This is what Calvin did. He then started to climb upward. Slowly but surely. These little steps towards the Change of your Life will, like Calvin, cause you to change your Position, and change your Posture. Once you change that it will cause you to want to change your entire Perspective in Life. Of course this all sounds simple and easy but its only the beginning. Calvin reached the top but realized he had to go out on (the) limb. You know, go the extra mile for change. Push yourself harder Tyree. You’ve come so far. Don’t Give Up or Give In. Trust the Stardust within you. Some of us are afraid to go out on a limb. We don’t trust the stardust within us most times but its there. You will make it! Just like Calvin did. “Posture, is the position u hold,” She stated. When she went on to explain Posture in ‘Dancer’ term, I knew that was GOD. He always has to throw in a sign. I am a Trained Dancer so of course what she said next was relateable. She repeated “Posture.” Then said, “Posture is the Behavior that you engage in that either Impresses someone or Misleads someone.” We live in a time when we have to have an Erect and Upright posture. You can’t be out here walking around hunched over like you’re Powerless. Walking like that will have folks out here thinking you are a pushover, or weak. Slouched Posture will have people saying and doing anything to you. 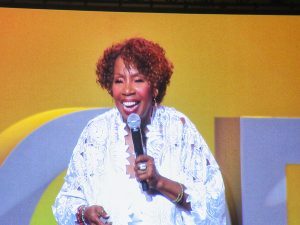 Iyanla showed us something she learned. She showed us how to STEP TO THE LEFT AND EVERYTHING CHANGES. She said, “The only thing that will keep you where you were is your mouth and your mind.” So many of us don’t live in the moment. We live in the past and the present or the present and the future. Take what happened over there and re-interpret into something that you need over here. Change your Position and your Posture and go out on the limb! Ms. Vanzant told me, when u are changing your Position and your Posture you are going to be blind. What use to work wont work anymore. That is what will change your Perspective. When you change your Posture and your Position, you have to be able and willing to go into a deep dark place in Stillness. Remove all distractions. Go within yourself because what you need in order to change IS ALREADY IN YOU. Iyanla assured me when the Change starts taking place, my Perspective will shift. She said, Tyree, you will see the Purpose of what you went through and are still going through. Who you are? Who you will become. The Change, little by little, you will see it. Be willing to be blind, skinless, vulnerable, so that you can learn. You will be OK. You are Blessed. Change is Good and is never too late. I have re-focused since coming back home to New York. I am proud of what I have accomplished in the last month. I am a work in progress but I have noticed a change. I have a new Perspective and my Master Plan has multiplied but I am taking it all in Stride. One step at a time. One foot in front of the other. This message was so deep I wanted to share the Actual video I captured. Please watch it and leave a comment on what you got from her words, either on this post or on the YouTube video. Thank You so much for reading this. It’s a bit more personal than my usual but I want to be a Blessing to someone. Hopefully someone can gain a lot of positive vibes and possibly answers to whatever it is they are going through. 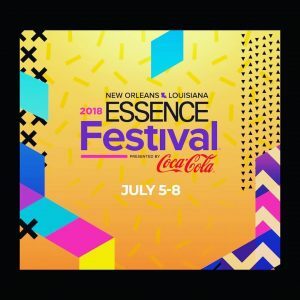 This entry was posted in WHAT'S THE WORD and tagged EMF18, EMF2018, Essence, Essence Festival, Essence Magazine, Fix My Life, Iyanla Vanzant, New Orleans, OWN. Bookmark the permalink. This hit my heart bestie. I’m with you for the ride. Love you and thanks for sharing. Yes, ma’am…..one foot in front of the other! Keep moving forward! One moment at a time. You got this!